Since completing my two-part retrospective on the Garden of Delights 'krautrock' reissue label, a grand total of eleven more releases have come to the marketplace, yet another smorgasbord of classic German progressive and psychedelic rock. Three of these I already covered in an earlier update, leaving these eight for the current analysis. One extra nice thing about these latest offerings is that four of them effectively replace the dodgy Germanofon CD reissues that are thankfully out-of-print, and for which royalties were never paid certainly. And given the level of care that is put into any Garden of Delights reissue package (again the booklets are packed with bios, photos, lyrics, etc. ), no label just looking to make a buck could possible match the quality of these discs. Even when vinyl transfer was necessary, the sound is immaculate. Kudos to the remastering engineers! We start off with the mega-obscure Twilight, a short-lived Bonn entity whose 'Day and Night' album (CD 041, 1975) was actually never released until now. In fact, dragon artist Ciruelo (who has done album covers for the label before) was commissioned to do a cover for this release. 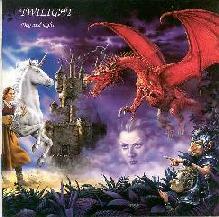 However, with the castle, unicorn, and sword & sorcery images in Ciruelo's fine work, one might get the wrong impression about the music within. True, the opening title track is a wonderful spacey tune in the style of the 'Wish You Were Here' album, complete with soaring guitar work and delicate piano. However, the remainder of 'Day and Night' is a microcosm of the entire pseudo-progressive blues-based rock of the early '70s. Bad Company, Uriah Heep, UFO, Trapeze…they all came to mind at one point or another. Good stuff really, recorded and mixed well, and the quartet benefited from a pair of talented vocalists in Volkmar Kramarz (guitarist) and Jurgen Bieler (bassist), all lyrics presented in English. The peculiar Canterbury-flavored "Leaving in the Morning" was yet another divergence, and showed off the band's more eccentric and experimental side. The album was passed up by EMI Electrola since the progressive era was rapidly coming to an end in the popular culture, though it certainly should have warranted release. However, the band broke up in 1977 and the master tapes collected dust for an amazing 25 years - though they were never lost! Like many other contemporaries, Twilight certainly deserved a better fate - well, better late than never. Eulenspygel started out as the Royal Servants (their 'We' album released on GoD several years back), and then began singing in German - hence the name change. 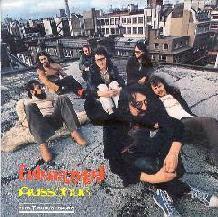 'Ausschuss' (CD 042, 1972) was their second album (following the successful "debut" 'Eulenspygel 2' album, also on GoD), a large-budget recording done at London's Abbey Road Studios under state-of-the-art conditions. 'Ausschuss' was an ambitious project, with compositions of great complexity and depth. In fact, Side One alone was a 22-minute symphonic rock opera about the life of "Peter the Orphan" entitled "Abfall" (German for "trash"). There are too many individual passages to even attempt an adequate description - "Abfall" is simply an over-the-top bombastic and heavy-handed composition. In other words, great 'krautrock.' Side Two was a collection of similar-styled progrock tunes, with folksy and jazzy influences, the highlights being the fine keyboard stylings of Karlheinz Grosshans on "Der Fremde" and Cornelius Hauptmann's flute-playing on the finale "Unteranenfabrik." Another 25 minutes of bonus tracks from a live TV performance (future DVD fodder?) and two demo sessions are thrown in for good measure. The recording quality is surprisingly good, and the fine track "Kinderlied" was good enough to be later brought back to life for the third Eulenspygel album on Bellaphon (maddeningly titled 'Eulenspygel'). This extended 'Ausschuss' package is certainly a remarkable piece of work and definitely recommended, though I still think I prefer the 'Eulenspygel 2' album - a matter of personal taste more than anything else. Look for a future GoD release of an Eulenspygel concert from 1971. 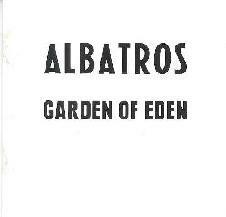 The CD reissue of Albatros' lone recording entitled 'Garden of Eden' (CD 043, 1978) was the result of yet another patented Garden of Delights foray into the backrooms and attics of the music collectors' virtual domain. The six-piece band from Hagen in central West Germany lasted for a good eight years or so, but never caught the attention of a larger audience like some of their contemporaries. 'Garden of Eden' was released in an edition of just 500 copies on the small Lipstick label, and only with a plain black and white cover given that the artwork especially commissioned by vocalist Hansi Koppen had been stolen. The 40-minute album was made up of just three tracks, and it's suggested in the biography that these versions were shortened from the originals! "A Man Like Me" is the side-long track, and it's my opinion that those who criticize the excesses of progressive music might just have a legitimate beef with this long-winded opus. I'm not sure why, but this one just comes across as "overcomposed" and yes, excessive. And Koppen's voice is rather ordinary. The remaining two tunes are a big improvement, the krautrock march of "Sundriver" (think Amon Duul II's "Dreams") laying a great foundation for all sorts of interplay between guitar, keyboards, and Thomas Buscher's intricate percussion work. Buscher's talents shine even moreso on the finale (the 10-minute title track), which doesn't quite live up to the expectation based on the fabulous opening spaced-out sequence, but still is an enjoyable listen. Albatros might (fairly or unfairly) be described as Poor-Man's Nektar, which means that whereas 'Garden of Eden' is right up my alley, I just think there are better works out there of similar content. 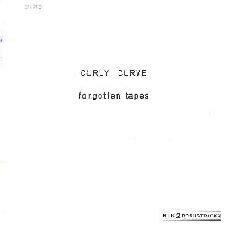 Curly Curve originated in Berlin in 1968, and was a frequent live act in the same clubs that commonly housed the so-called 'kosmische' bands (Agitation Free, Tangerine Dream, Ash Ra Tempel, etc.). In fact, bassist Kurt Herkenberg was a Tangerine Dream alum. However, whether or not they shared the same psychedelic tendencies in those early years, by the time of their lone studio album (a self-titled debut, released in 1974 - now available as a CD on the Repertoire label) Curly Curve was merely a solid blues-rock band with little to challenge the imagination. In 1981, the Okotopia label issued (its lone release, actually) an LP of 'Forgotten Tapes' (now on GoD as CD 044), recordings from 1974 (commonly misunderstood to be from 1972-73) intended for a second album that never came to fruition. The CD adds two additional bonus tracks to the original eight-track LP, making a 47-minute compilation. The easiest way to sum up Curly Curve c. 1974 is as the "German Spooky Tooth," with lead singer Hanno Bruhn even reproducing the gritty flavor of Mike Harrison's soulful crooning. For an old 4-track recording that was never expected to see the light of day, it suffers from only a bit of muddiness here and there - hardly a distraction. But for the most part, what are essentially ten blues-rock numbers (that could have been written by any one of a hundred different bands from around the world) give cause for one to think that 'Forgotten Tapes' was perhaps its deserved fate. That said, Curly Curve played with high energy, and benefited from the occasional colorful guitar playing of Bruhn and Martin Knaden. Xhol Caravan started out as Soul Caravan in 1967, and released the 'Get in High' LP in that same year on the very prominent CBS label. With two black American vocalists and a Motown-influenced bassist, this work was undoubtedly true to the 'soul' moniker. As the band went through several lineup changes and revised their sound, Xhol Caravan (later to be shortened to just Xhol) quickly became one of the most innovative bands in all of the world, not just in Germany. With 'Electrip' (CD 045, 1969), they bridged the gap between jazz and rock in a similar way as contemporaries like the Mothers and the Canterbury bands (e.g., Soft Machine) and I can only think that they were tremendously important for forwarding the avant garde approach to music-making all across Europe. (A prominent TV performance alongside Zappa, Amon Duul, Tangerine Dream, and others demonstrates that the band was well-known. Sadly, although this video still exists in good condition, its release seems blocked by legalities…a damn shame.) Led by a pair of saxophonists (Tim Belbe and Hansi Fletcher), Xhol Caravan manufactured a crazy mix of psychedelic rock and highly syncopated jazz that was way ahead of its time. Sound experiments and counterpoint melodies abound in the album's five compositions in a stunning display of craftsmanship. "Electric Fun Fair" is bouncy, fun, and eclectic in a way that I always thought Dave Stewart (Egg, Hatfield) and colleagues created a year or two later. The 18-minute "Raise Up High" continually reinvents itself over and over - very inspiring! The GoD CD (improving greatly upon the old Germanofon boot) adds in a rare 7" single from the Soul-Xhol transition period. 'Electrip' is a fantastically important album in Krautrock history, and I predict it will become amongst the top two or three sellers for the label. I can't say enough good things about this album. I'm looking forward now to their followup 'Hau-RUK,' a soon-to-be GoD reissue, attributed to Xhol. When Conny Veit had been invited to Munich to work with Florian Fricke on the 1972 Popol Vuh album entitled 'Hosianna Mantra,' his own band Gila back in Stuttgart pretty much splintered apart from being leader-less for so many months. 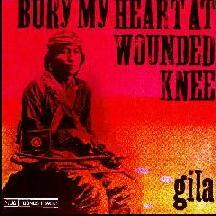 As Veit continued on in Popol Vuh for the next few years, he still desired to put his own compositions to vinyl and hence Gila was reborn to make 'Bury My Heart at Wounded Knee' (CD 046, 1973), which turned out to be the last Gila record. With Fricke on piano and mellotron and Amon Duul II drummer Daniel Fichelscher (also a Popol Vuh draftee) in the studio, the trio (along with Veit's girlfriend Sabine Merbach providing additional vocals) created a brand new Gila sound. The occasional instrumental break with soaring guitar is still to be heard, but the majority of the music is dominated by Fricke's tinkling grand piano and Veit's jangly 12-string acoustic guitar. The lyrics for the album were drawn from Dee Brown's translation of American Indian writings, concerning their plight at the hands of the invading white men. "Sundance Chant" is the oddest piece, with vocals delivered in the style of the Mamas and the Papas, but yet given an odd melancholic flavor, in part due to the peculiar metronomic (though incredibly fluid) drumming of Fichelscher. A recently-discovered unreleased track "Mindwinds and Heartfrost" was added on as a bonus, yet again different in style, with particularly strong and twangy vocals from Veit. A totally different album from either of the other two Gila works, but yet still fascinating in its mood and spirit. From Baden Baden in southwestern Germany, Brainstorm were made up of classically-trained musicians who instead took to progressive rock. As a tight unit with impressive chops, the band quickly found a home on the Speigelei label and put out two albums in the early 1970s made up of jazz-influenced tunes colored by the soulful vocals of (future Guru Guru saxman) Roland Schaeffer. 'Second Smile' (CD 047,1973) was the followup to 'Smile a While' (now on a Musea CD) and although the record company was reluctant to release it, they were contracted to do so. 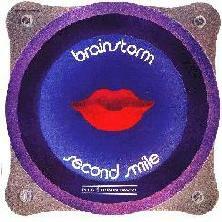 Sometimes serious, at other times quite silly, Brainstorm have the same sort of charm as Egg, Soft Machine, and Happy the Man. Tracks like "Herbst" show off Rainer Bodensohn's delectable flute-playing. "Marilyn Monroe" (a common subject in krautrock for some reason, it seems) is a strange work, with a middle spoken-word section that attempts to explain what Brainstorm was all about. A funky honky-tonk version (think Traffic) of the Brainstorm ethic is tacked onto the end of the original LP in the form of "You're the One," a rare 1973 7" single. Fans of Canterbury music will enjoy this one immensely, and the occasional blast of psychedelic guitar here gives Brainstorm an edge over some of those totally keyboard-dominated groups. Members of Brainstorm went on to do a great deal of music for German TV, and then recorded a concert for WDR Radio that will soon be another Garden of Delights CD. Good news! The four members of the purely instrumental Erna Schmidt thought it would be humorous to make unknowing audience members wonder when Erna was going to come out and sing. Nice joke. In the late 60's, out of the ashes of the beat-minded R&B Corporation from Stuttgart, Erna Schmidt came into being as guitarist Hubert Stutz joined and brought a Hendrix-influenced edge to the sound. Flute/sax player Hartmut Mau later came on board to make a four-piece unit that eventually moved into the infamous Wintrup mansion that later also became the home of the much more commercially-successful Kraan (Hattler even filled in on bass for a spell). 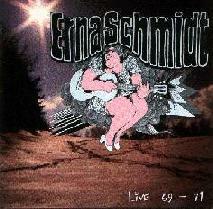 In fact, Erna Schmidt failed to release any music whatsoever (the contract with Ohr never panned out as the group disintegrated before ever making it to the studio), and it's only because of the amazing stroke of luck that a friend of the band had personally recorded many of their gigs (and held on to them all these years), that this CD even exists. From those 20 hours of raw music, the best hour's worth was selected, meticulously cleaned and remastered, and so Erna Schmidt's debut ('Live '69-'71,' CD 048, 2000) now comes almost thirty years after they disbanded! The best of Erna Schmidt is somewhere between Led Zeppelin's half-hour live version of "Dazed and Confused" and "Text of Festival"-era Hawkwind - bluesy and totally stoned. "La Folie d'espagne" is such an example of the mind-blowing psychedelia that Erna Schmidt was capable of creating. Other works are somewhat more restrained in nature, a folksy passage here (giving Mau a chance to be heard) and then a few light, playful guitar licks there…but you don't need to wait long before they blast through with another amazing lysergic-tinged jam. This is really brilliant stuff, and the recording quality is amazingly crisp and clear, and nary a dropout to be heard! One of the most important releases on the Garden of Delights label, given their complete lack of presence anywhere but in the memories of those who were there.until now. Well, that's gotten us up to date on the most recent Garden of Delights reissues - man, I wonder when all this great old stuff will run out? Given the list of several dozen albums that are on the docket for future release on the label, it certainly isn't very soon. What an incredible time for music the early 70s was! Even though I find a great deal of 'modern' music to be of great quality, I doubt there will ever be another period so full of innovation and artistry. 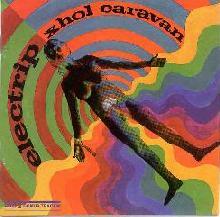 And from these eight, of course Xhol Caravan's 'Electrip' is the one that stands out. But don't overlook bands like Erna Schmidt just because the name is totally unfamiliar. What a find this is! from the others, it's hard to recommend one over the other since they are all quality works. So, because each has a distinctive style, I can only suggest that you choose the selections that match your personal preferences. For more info about Garden of Delights, including future release titles, the full discography, and links to some sites that carry GoD discs, you can hop over to our own special homepage for the label right here at: http://www.aural-innovations.com/god/main.html.